Perhaps the family meal is a good indicator of how one is raised? My parents always served rice with meals which usually comprised of seafood and stir-fried meats with vegetables. We even had rice for breakfast-champorado or chocolate rice porridge-one of my favorite childhood dishes. I rarely ate peanut butter and jelly sandwiches or fast food for meals until I was in my teens. I had zero interest in books and reading until the middle of first grade, when my teacher, Miss Henderson, worked her magic. She encouraged me to paint and draw as much as I wanted. Miraculously, I went from the lowest to the highest reading group in a short time. When I turned eight and got my library card, I went on a reading rampage, devouring stacks of books each week. I loved Greek myths, folk tales, stories about famous people as children and anything my older sister was reading. I was also a fan of chapter books, the Encyclopedia Britannica and comic books. What were you like as a young artist? I daydreamed all the time, frequently lost in my own world. However, ours was a creative home. My mother crocheted and sewed. She made us paper dolls with renditions of nipa huts from her beloved homeland. I watched my older siblings draw and started mimicking them. Soon, I developed my own style of drawing. When I first tried painting, I fell madly in love with it, loved color and used it boldly. In upper elementary school, I developed a reputation for drawing people (and my friend, Belinda, was the "go-to" gal for hand-drawn horses). 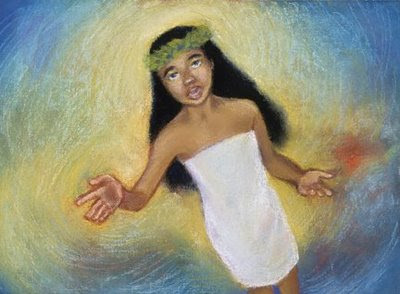 I received tons of encouragement from my teachers and even won a drawing contest and scholarship at age eleven. Drawing and painting became as essential as breathing. What inspires and motivates you to be an author illustrator for children? As a writer and artist, I'd never completely left the world of the child. I loved my childhood! It was a time of wonder and discovery and of seeing life through a wide lens of hope and possibility. I love being around kids. I've taught, entertained, coached and played with kids in work, volunteer and personal settings. Kids are an exceptional audience. Curious, eager and unjaded, they'll follow you deep into the jungles of story. But they aren't easily fooled or impressed. If they like or dislike something or sense that you are "insincere," they won't hesitate to tell you. They keep me "honest" in my work and I relish that challenge. What was your path to publication as an author illustrator for children? I've always loved storytelling through writing and pictures. I smile when I think of some of my earliest stories--the mouse who painted abstracts and a fable featuring a giraffe named Geoffrey (pre-ToysRUs). I wrote almost as much as I painted but I was known for my visual work because I kept most of my writing to myself. Maurice Sendak's iconic book, WHERE THE WILD THINGS ARE made a huge impact on me when I was a teenager. I had a visceral reaction while reading that book to my nephew. I knew that picture books had a special place in my heart but it was years later, after I had my first child, that I listened to my Muse and took initiative. I started taking classes on picture book illustration, participating in critique groups and building my portfolio. I was primarily interested in being an illustrator but once my Muse had a feel for creating manuscripts and book dummies, I was hooked. I knew I wanted to write and illustrate my own concepts. THE SLEEPING GIANT: A Tale From Kauai. 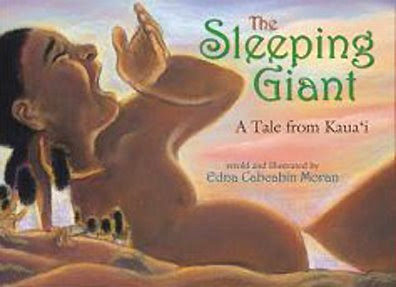 Edna's first picture book earned the 2007 Ka Palapala Po'okela Honorable Mention. "Fish scales fell to the ground and gave way to flesh... 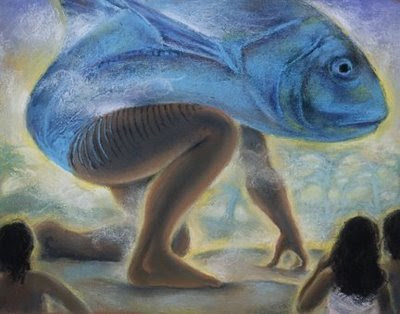 Bulging fish eyes changed into human eyes, framed by heavy black brows." "Pualani's heart raced. Her na'au, gut feeling, pressed her to keep walking until she stood at the giant's feet." What are your chosen mediums? What is your creative process like? I favor mixed media for my painterly style—acrylic underpainting with chalk pastel or gouache with colored pencil. For my line-art, I use Tombow brush pens or Faber-Castell PITT pen then digitally apply touches of color. My creative process begins with my Muse who is usually engaged in a dance of ideas and visual references. She can be coaxed into appearing at brainstorm sessions or she'll drop in unexpectedly, sometimes when I'm driving. It's my job to capture the ideas and impressions on paper. My artwork develops in stages: I go from thumbnails and rough sketches to highly-rendered drawings. In the final stage, I paint using my mediums of choice. I like to work on two or three paintings at a time to maintain energy and consistency between the pieces. By the end, I hope to have all the individual paintings "sing" as a complete work of art. Spot line-art image used in "The Bulletin," the Society of Children's Book Writers and Illustrators magazine. 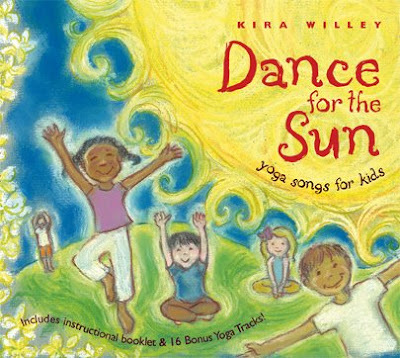 Cover for Kira Willey's award-winning musical yoga album. Can you tell us a little bit about your book tours, school visits, or workshops? 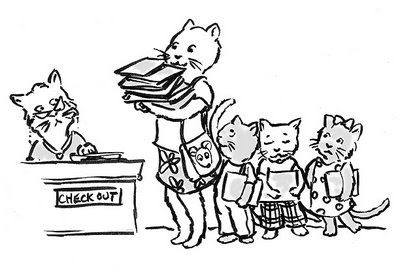 I enjoy doing author/illustrator visits and am thrilled to present to students of all ages, at a wide range of venues. My presentation style is conversational, fun and interactive. I like to highlight cultural and visual information, as well as, include personal and professional back-stories. Invariably, I end up complementing classroom curriculum with my assemblies due to the wide scope of material I cover. However, my workshop program is flexible and I'll gladly work with staff to tailor something for their students. 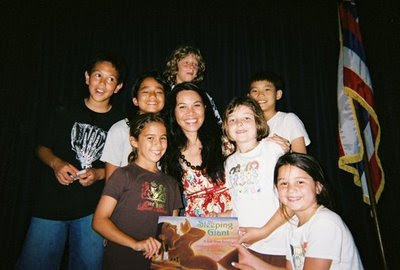 A visit with the students of Kamilo'iki School, Honolulu, HI. 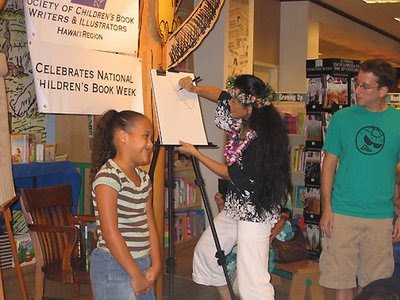 An illustration demo, Children's Book Week, Barnes & Noble, Hawaii Kai. 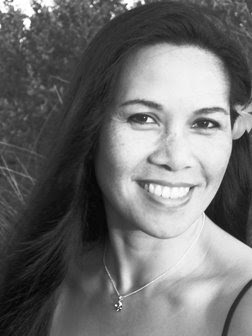 What are the challenges and rewards of being an Asian American author illustrator for children? Bridging the Asian Pacific cultural perspective with Western sensibilities within a given story poses a significant challenge. There's the logistic of keeping within the parameters of the work, such as limiting word count for the picture book format, and the art of crafting a seamless explanation for the cultural aspects. The rewards for bridging the "cultural divide" are severalfold: One's voice develops an authenticity which can propel the story to a higher level. Readers gain insight and appreciation for the culture. Who are your favorite Asian or Asian American children's and young adult book authors and illustrators? What are your favorite Asian or Asian American children's and young adult books? Why are they your favorites? I admire a number of Asian American authors and illustrators--Ed Young, Grace Lin, Lisa Yee, Allen Say, William Low to name a few. Each has a strong voice that comes through in his/her work. I'm pleased to see more Asian American and Pacific Island books entering the market. I have many favorites; however, off the top of my head, I love LON PO PO and SEVEN BLIND MICE by Ed Young and Lisa Yee's MILLICENT MIN, GIRL GENIUS. I also have a favorite adult title that deserves mention: WHEN THE ELEPHANTS DANCE by Tess Uriza Holthe. It is a "storyteller's book" and it spoke to my heart. I'd read it during my travels to the Philippines this spring. Again, these are just a few titles I'd recommend. There are more—so many more...:-)! Do you celebrate Asian Pacific American Heritage Month? How are you celebrating it this year? 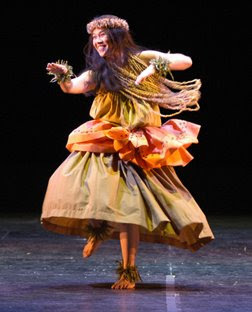 Over the years, I've danced hula with my halau, Na Lei Hulu, at Asian Pacific celebrations and concerts. This month, I've had some school assemblies and a family night event. It was a pleasure sharing my background and passion for hula and Hawaiiana. Hopefully, the audience walked away with a better understanding and appreciation for Pacific Island culture. Edna dances hula with Na Lei Hulu I Ka Wekiu. Photo by Lin Cariffe. 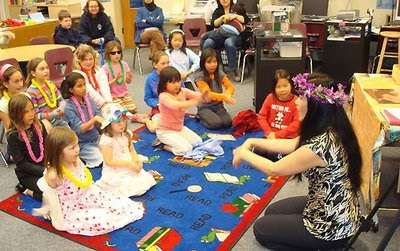 At Earhart School's family night, Edna teaches a sitting hula. I illustrated a new book that's coming out in the fall. 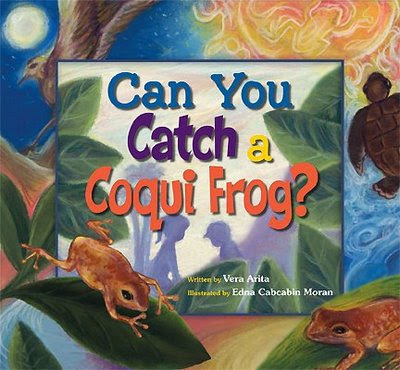 It's titled, CAN YOU CATCH A COQUI FROG?, written by Vera Arita. Also, my poetry appears in a middle grade anthology that will be out next year. I have several works in progress—a few picture books and a novel. Cover art for CAN YOU CATCH A COQUI FROG? And now for some link luuurv. Click here to read Jama Kim Rattigan's interview with Edna over at alphabet soup - it includes a recipe for lumpia! I love Edna's artwork! it is so beautiful! Just like Edna!!! Great interview! And I am a big rice advocate also!! Ello and Jama - So glad you guys enjoyed the interview with Edna. :D And hey, you are making me hungry. It's lunch time here. Now I want to eat a lot of rice! edna is not only talented but beautiful and just so big hearted. had the pleasure of meeting her at scbwi (she painted my calf, yes!) and then she came to support me at my signing. yay edna! and what a great month you are having, tarie. thank you for celebrating APA authors and illustrators! Cindy, yes, Edna is beautiful! And wow, she painted your calf? Jealous!! This month is so much fun. :D I already know who I want to interview next year. Hahaha! APA writers and illustrators ROCK. Very nice to learn about Edna's background and exciting projects, and I look forward to checking out your blog. Thanks for the interview!